The 2WW was an emotional roller coaster. My period usually comes at 26 days and Saturday would have been that day. I felt like my worst period to date was coming. Cramps, hot flashes, constant hunger, a full acne breakout…every time I went to pee I expected to see blood. This was how I felt for the entire weekend all the way to Monday. The last two times I was pregnant, on day 14 I had very strong lines that confirmed I was pregnant. 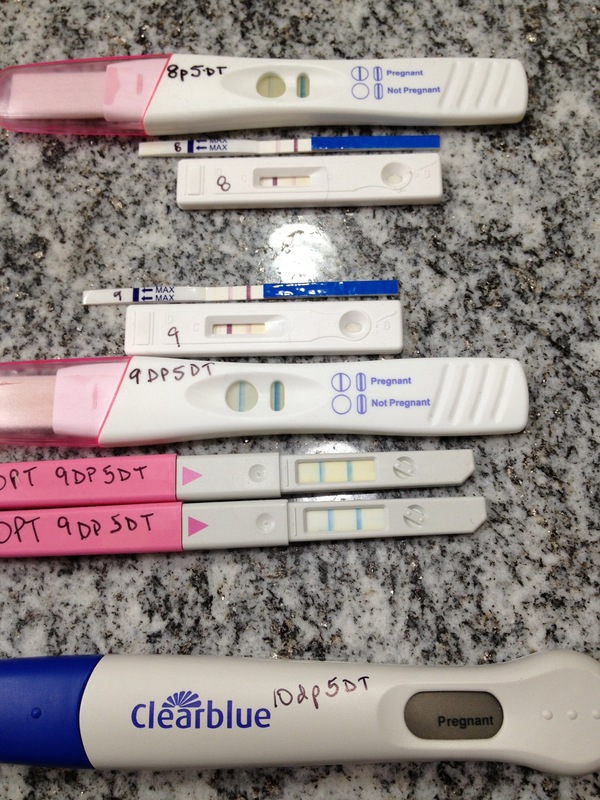 This time it was an extremely light blue line, and knowing that blue tests usually have evaporation lines I believed that this was a negative and it was all over…I became really depressed and told my husband I believe it did not work this time. We were both bummed all night and I was dreading going through all this again. That night I tried 2 cheap tests from the 99cent store to double check but the results were the same. Now I felt like it was a maybe. I came across some Internet sites that had mentioned using OPT kits to check for pregnancy since LH and HCG are very close and the results should register with both kinds of tests. I dug up two tests that I had from a two years ago and decided to try it out, what did I have to lose? It was better then buying more tests and my official blood test would be the next day anyway. Both tests came up positive, which made me feel a bit more positive. I woke up this morning and rushed to the doctors office to get the official test. And because I was officially insane at this point I picked up a digital test on the way in to try out while I was waiting for my blood work. I wanted to be the first to know either way and I knew the digital tests were the easiest to get solid results from…So yes there in the bathroom of my doctors office I sat and killed the 3 minutes to find out. The word pregnant popped up and I relaxed for the first time in days. With a smile on my face I walked over to the blood draw chair and let the nurse do her business. At about 3:00 this afternoon I got the call to confirm it, yes I was pregnant and my HCG level was very good (478). I need to go back on Friday to do a second blood test. With the twins I was 430 on the same day, is there any chance it could be triplets? I pray that it’s not. The risk is less than 5% for triplets, 40% for twins and 55% for a singleton. I’m praying for one, multiples really scare me after the NICU experience with my girls. New worries….